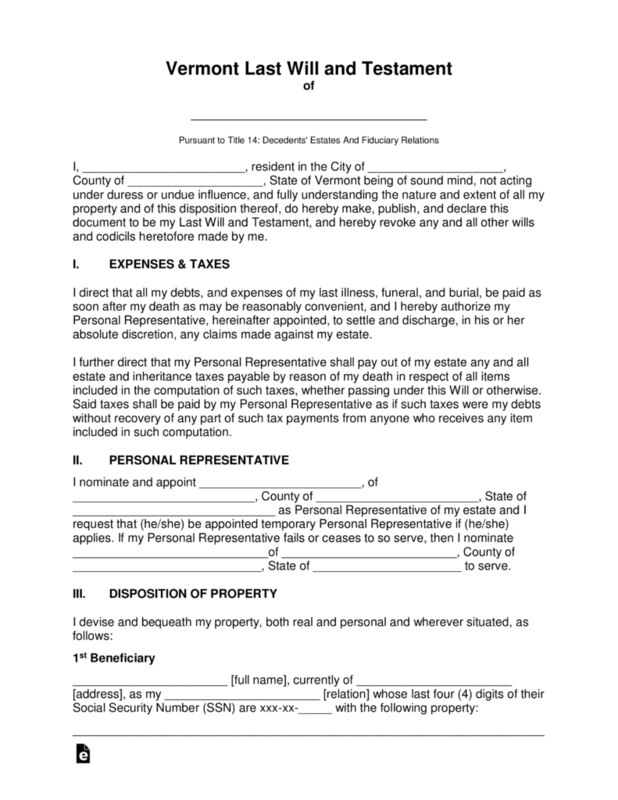 The Vermont Last Will and Testament is considered a legal document that the state allows a testator to create that document that will be made available to a chosen representative to distribute the assets included in an estate to the testator’s chosen beneficiaries. Assets may include fiduciary, personal, real estate, life insurance. These assets may be meant to continue to protect the immediate and/or extended family, friends or even pets. Other beneficiaries may be research institutions, educational or even foundation funds. When the testator has completed the list of distributions, the document will then be witnessed and signed, then notarized. 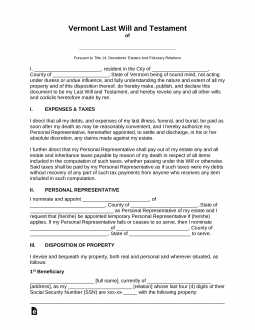 This document may be revoked or changed at the will of the testator. Signing (14 V.S.A. § 5) – Shall be signed by the Testator and by Two (2) or more credible Witnesses in the presence of the Testator and of each other. Step 7 – Notary- As the testator completes the document, all signatures shall be witnessed by a commissioned notary public of the state.